Candidate Lance Coulter said he knew who the group was before taking photos with its members at a UCP pub night. 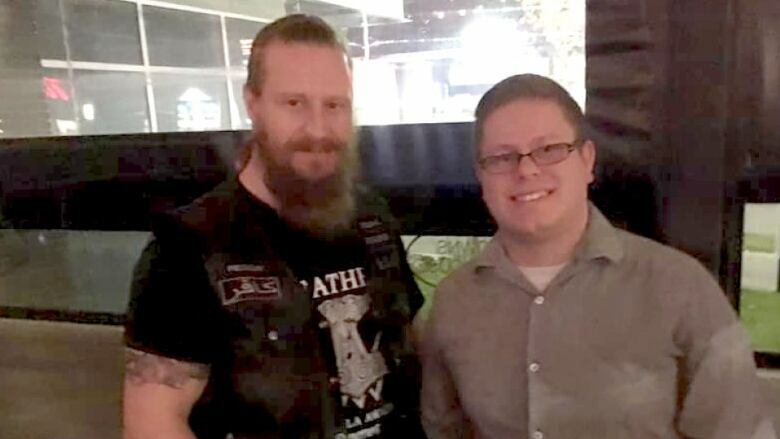 Two United Conservative Party candidates opened a public forum Wednesday evening by denouncing the Soldiers of Odin after they posed for photos with members of the hate group last week. In their opening statements, Edmonton-West Henday Constituency nomination candidates Leila Houle and Nicole Williams echoed what they said earlier this week — that they don't support the group's views. "I've learned a lot from it moving forward and we'll be a lot more careful in the future," Williams said before the forum got underway. The third candidate, Lance Coulter, didn't comment on the controversy in his opening statement. Prior to the forum at Hyatt Place, however, he told reporters he knew who the group was before taking photos with its members at a UCP pub night. Coulter said he looked them up when he recognized the Soldiers of Odin symbol some members had on their clothing. He said he read a CBC story that noted how some Canadian branches have said they don't hold the same extremist views as the original Finnish group. He decided to "give them the benefit of the doubt." "People showed up to an event. They were polite. They were cordial. I said hello, had a conversation with them," Coulter said. "Now I don't agree with everything that they stand for. Nevertheless, people have a constitutional right to voice their opinions and I'm not going to deny them that." Coulter said he doesn't think the debacle will affect how minority communities vote in the nomination race. When asked about an online report by PressProgress that said he follows alt-right and anti-Muslim groups on Facebook, Coulter said it was "utterly ridiculous." "Calling somebody a racist, a white nationalist without any kind of substantive evidence in any way shape or form, it's defamation of character," he said. Earlier in the day, Leila Houle asked Coulter and Williams to consider pulling out of the race because she thinks she's the best candidate to fight hatred. The Cree woman from Whitefish Lake First Nation said she has personally encountered racism, and will push a future UCP government to create an anti-hate task force. On Wednesday, Leila Houle asked her competitors to consider dropping out of the nomination race. (Anna McMillan/CBC) It would monitor members of hate groups and publicly expose them if they work around vulnerable populations. "I have a plan and I really feel that I am the best candidate going forward in tackling this issue and the issues that face the people of West Henday," she said. Both Coulter and Williams said they won't step down. Despite the controversy the candidates have faced over the past week, they spent the majority of the evening talking about their plans to "bring back the Alberta advantage." Key issues highlighted at the forum included the carbon tax, the NDP's new curriculum, and the provincial debt. In a statement, UCP spokesperson Christine Myatt said the party's platform is still being developed, and more concrete plans will be announced closer to the 2019 election.